by Mott, Robert L.; Untener, Joseph A. The leading applications-oriented approach to engineering fluid mechanics is now in full color, with integrated software, new problems, and extensive new coverage. 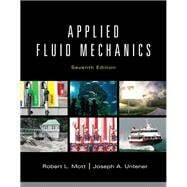 Now in full color with an engaging new design, Applied Fluid Mechanics, Seventh Edition, is the fully updated edition of the most popular applications-oriented approach to engineering fluid mechanics. It offers a clear and practical presentation of all basic principles of fluid mechanics (both statics and dynamics), tying theory directly to real devices and systems used in mechanical, chemical, civil, and environmental engineering. The 7th edition offers new real-world example problems and integrates the use of an online downloadable demo of world-renowned PIPE-FLO® software for piping system analysis and design. It presents new procedures for problem-solving and design; more realistic and higher quality illustrations; and more coverage of many topics, including hose, plastic pipe, tubing, pumps, viscosity measurement devices, and computational fluid mechanics. Full-color images and color highlighting make charts, graphs, and tables easier to interpret organize narrative material into more manageable “chunks,” and make all of this text's content easier to study. This applications-oriented introduction to fluid mechanics has been redesigned and improved to be more engaging, interactive, and pedagogically effective. Completely redesigned in full color, with additional pedagogical features, all designed to engage today's students: This edition contains many new full-color images, upgraded to improve realism, consistency, graphic quality, and relevance. New pedagogical features have been added to help students explore ideas more widely and review material more efficiently. Provides more hands-on practice and real-world applications, including new problems: Includes new real-world example problems and supplementary problems. Students can access an online downloadable demo of the popular PIPE-FLO® software to complete select activities. Updated and refined to reflect the latest products, tools, and techniques: Contains updated data and analysis techniques, improved problem solving and design techniques, new content on many topics, and extensive new references. "It is a textbook, nothing special so not a whole lot to say about it." Applied Fluid Mechanics: 3 out of 5 stars based on 1 user reviews.